The songbook features 19 songs from Bosnia, Croatia, Serbia, Macedonia and Bulgaria. Songs are transcribed in two, three and four voice harmony with complete translations and a pronounciation guide. The companion CD includes all 19 songs in duet, quartet, large and small ensemble combinations. Some songs are a cappella, others accompanied by accordians, guitar, bass, tamburicas and dumbek. 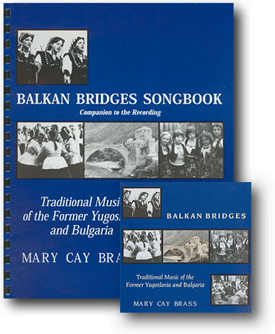 Mary Cay Brass lived in the former Yugoslavia on a Fulbright scholarship from 1976-1978. She currently directs several community choruses specializing in music from Balkans as well as other community-based traditional singing styles. Please see options below if you don’t want the book.